This French bistro favorite is wonderful and adapts to vegan perfectly. While traditionally made with goose or duck fat, this lighter, healthier version is just as good without the bad fats. 1 1/2-2 lbs of Gold Potatoes, sliced 1/4 inch think. I leave the skins on for extra flavor. 4 cloves of Garlic, peeled and sliced very thin. In your largest lidded sauté pan, melt your Earth Balance on medium/high heat. 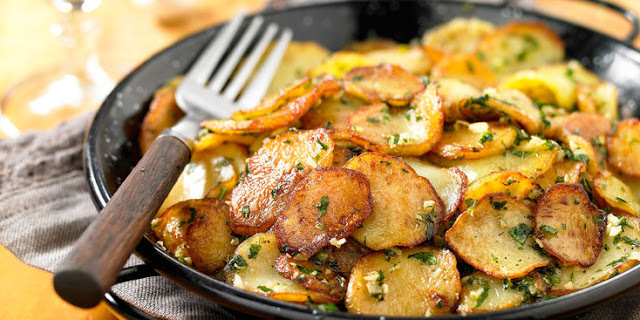 Gently lay your potatoes into the pan in one layer. Allow them to begin to brown, add your water and put on your lid. Leave it for 20 minutes, then gently turn over each slice and add your garlic, salt and black pepper. Put the lid back on for an additional 20 minutes. Then remove the lid and increase the heat for a further 5 minutes to finish browning. Add the parsley and serve. Homemake Pizza Dough - The real way!